Use MITA’s powerful tools and sound-drenched environment to discover music’s rich stories and speak its language step by step. Whether you’re a total newbie or an outright connoisseur, exploring centuries of sound and culture was never so much fun. Curious About Music? MITA Is for You! Make sense of music’s stories by learning about their rich cultural contexts, often tied to everyday concepts (like baseball!). Acquaint yourself with all of Western music’s major movements and composers, from the Middle Ages to Minimalism, from Hildegard of Bingen (born 1098) to John Adams (born 1947). 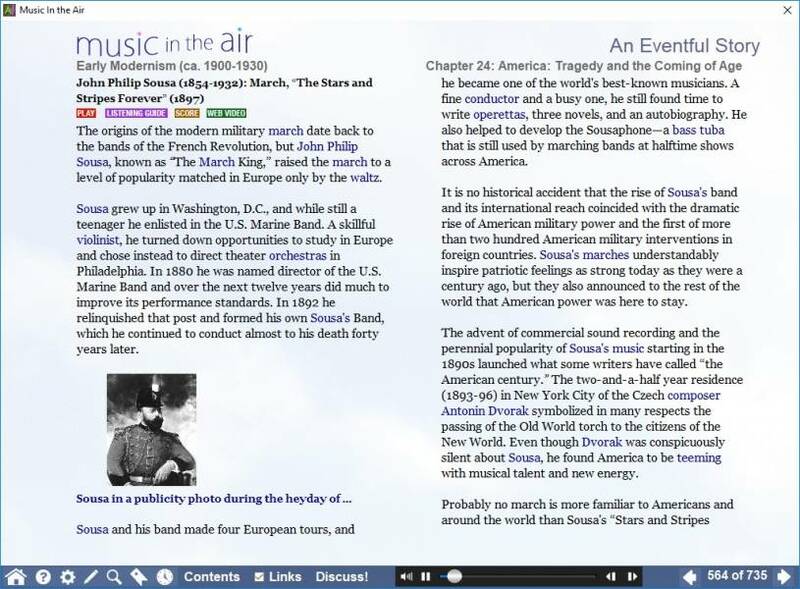 Click the “Play” icon to hear the work under discussion while you read, or choose “Listening Guide” or “Score” for deeper resources. Jump seamlessly back and forth. 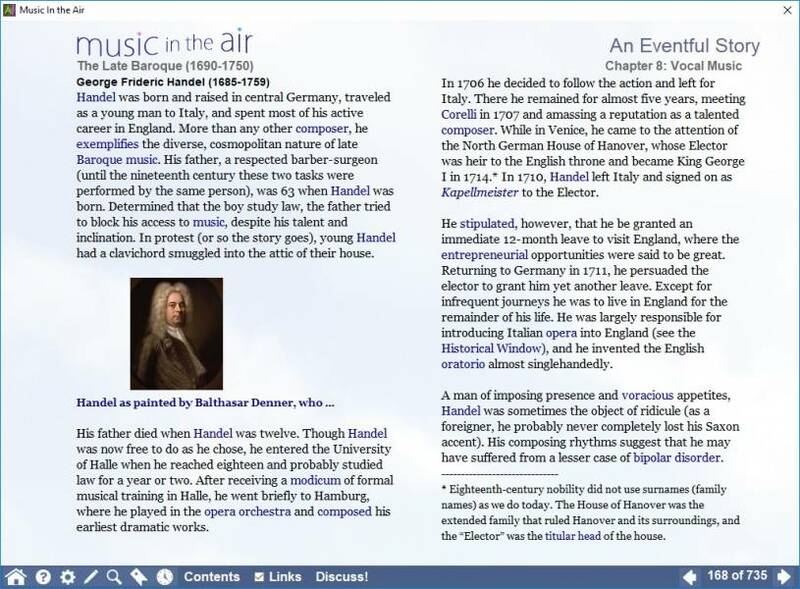 Musical concepts and challenging English vocabulary link directly to the Deep Glossary. 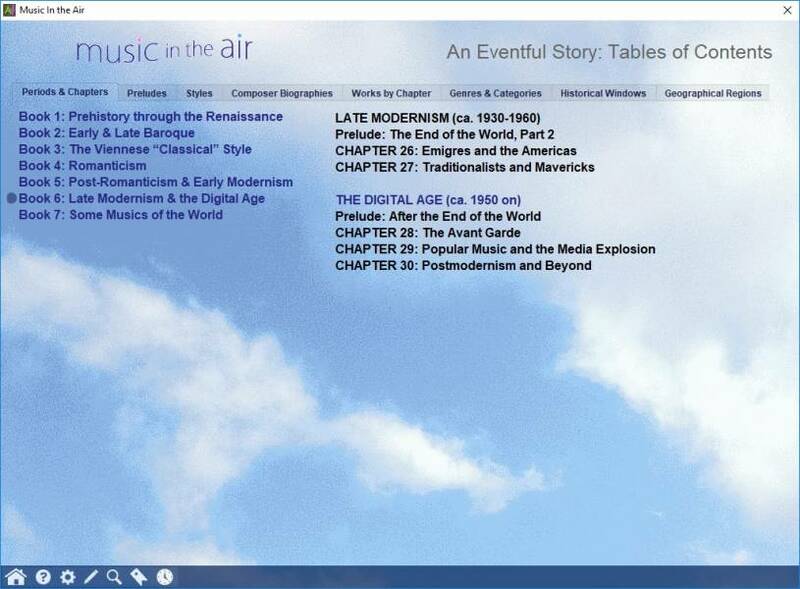 Alongside Western art music, explore jazz and popular music. Plus, get to know a variety of world music traditions via intimate video encounters with gifted performers. 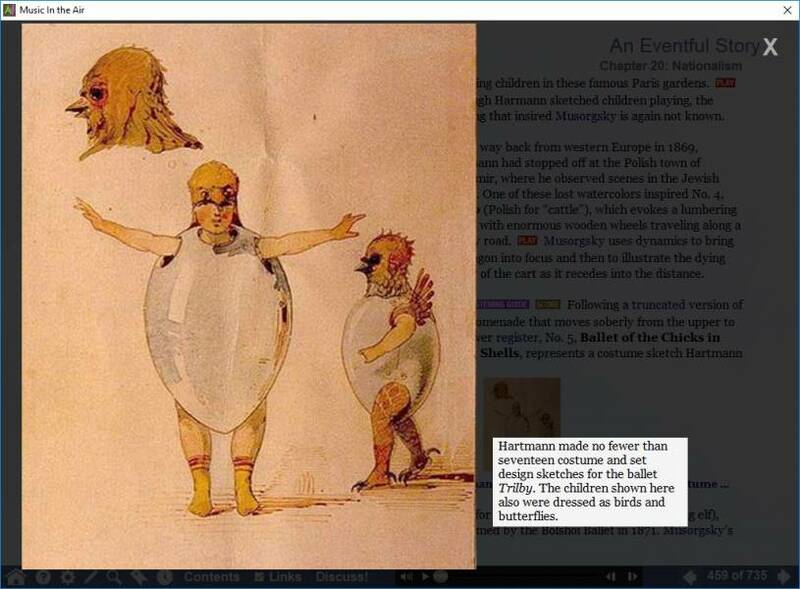 Click on in-text thumbnails to view hundreds of full-screen images and take in the full captions. Read all 800+ pages of An Eventful Story “cover to cover” to experience music history chronologically, or approach it through the lens that most interests you, be it composer, geography, or any other of the eight ways to sort. Use MITA’s search function to track down pieces, terms, or whatever word or phrase you’re looking for. MITA teems with performances by the best of the best, from the Berlin Philharmonic to the Takacs Quartet, from Dame Joan Sutherland to Sir Georg Solti. Bouncing blocks take you through each section of every piece. To hear any location (“Closing area,” for example), simply click on it, and voila. Most Guides include two toggle-able levels: Level 1 (for relative beginners), requiring you to have no prior musical training, and Level 2 (for more advanced learners), challenging you to connect what you hear to musical ideas and language you already know. As the music plays continuously, MITA’s interactive bouncing blocks guide novices and experts alike through the written music. It’s easy to notice the relationships between what you hear in the recording and what you see on the page—even if you don’t read music (trust us!). Click anywhere on a page to hear the music from exactly that point. Go through a score page by page, jump to a specific page number, or click on “Go To” to play from a specific moment in the piece (“Coda,” for example). Each score opens with an enlightening overview and a map of the piece’s sections. Don't just read definitions: hear them! In-text “Play” buttons illustrate written concepts. Hundreds of textual pop-ups tell you exactly what you’re hearing when you hear it. We meant it when we named it the “Deep” Glossary. Many entries offer extended essays with further suggestions for more reading. But each entry starts with a simple barebones definition if that’s all you need. There are lots of bright, curious people who want to open their minds to the vibrant world of music but are unsure about where to start or uneasy engaging in its conversations. MITA seeks to democratize the classical music world by bringing you to a place of confidence and deeper enjoyment in your musical journey. The historical accounts within MITA can be read sequentially—which is to say from the dawn of Western music in ancient Greece until the extraordinary global musical diversity of today—in a way that both entertains and enlightens, saturated throughout with sounds and images. If you want to expand your musical vocabulary, follow the glossary’s Musical Languages Guide, which starts with essays on the most basic terms (e.g. “music,” “rhythm”) and builds from there. MITA’s built-in structure provides guidance informed by our team members’ combined 100+ years of experience as teachers (and learners!). If you know what you want, skip the built-in structures altogether and use MITA’s powerful sorting features to make the experience yours. The search feature allows you to find all mentions of any term within the program. 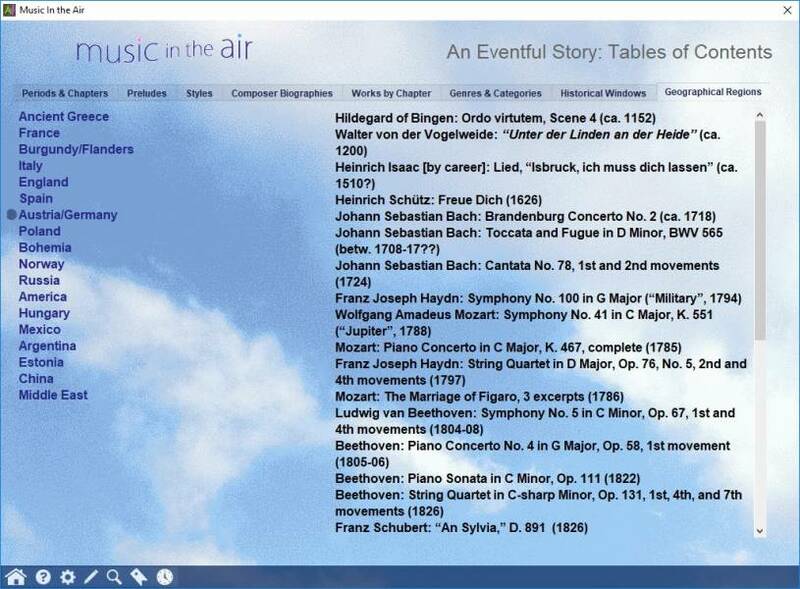 An Eventful Story can be accessed eight different ways (chronologically, geographically, by composer, etc. ), and most Listening Guides can be set to novice or advanced levels. MITA places historical and theoretical notions within cultural contexts that are truthful and make no attempt to conceal paradoxes or contradictions. 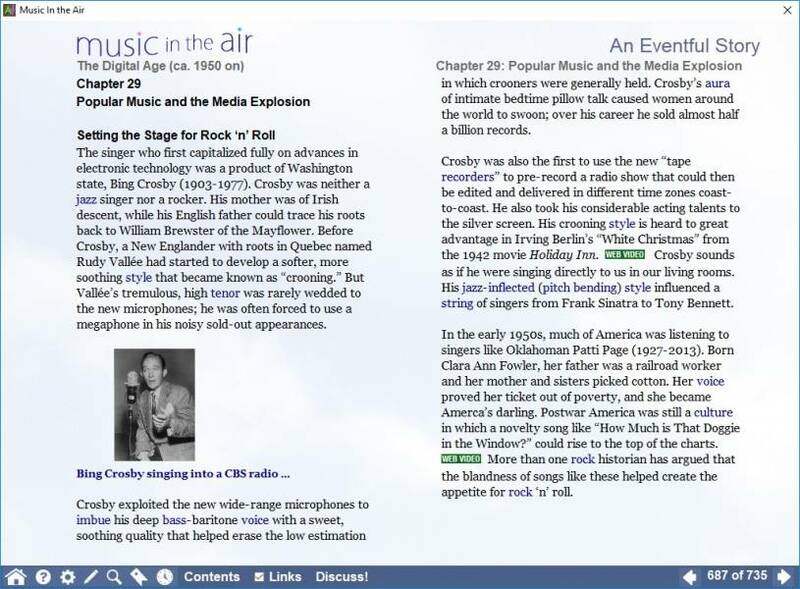 The narrative relates music to everyday ideas, so you don’t need to be a theory guru to wrap your head around them. Making connections to ideas you already own has been shown repeatedly to be the best predictor of what you retain. Whether you’ve never read a note of music or logged years of theory as a music student, MITA brings a whole new level of engagement with its Interactive Scores. They don’t just stare back at you—every bar, phrase, and theme plays for you on command, guided by MITA’s interactive bouncing blocks. Optional annotations provide insights about each score’s most revealing dimensions, with terms linked to the Deep Glossary. 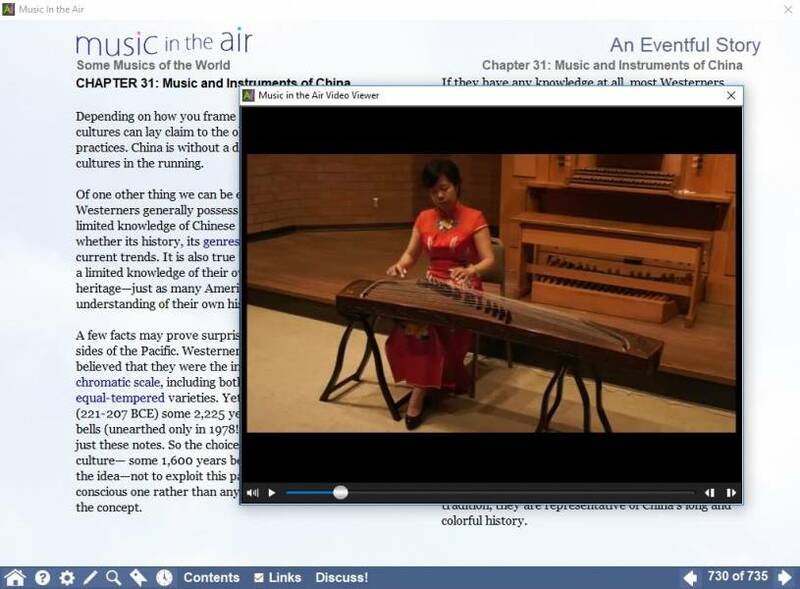 MITA is used as a textbook in formal music appreciation and history courses and as such offers a depth of coverage to rival comprehensive adult and continuing education courses in music, in a joyful environment and at a fraction of the cost. Because MITA is organized in layers, it suits learners across various levels: just choose how deep you’d like to dive. Our team has been developing easy-to-use multimedia learning tools for people at all levels of familiarity with computers since 1989. Fostering a passion for live music is central to the mission of ArtsInteractive. MITA can help you make the most of your live listening experience. If you’re going to hear a piece of music that’s in MITA, well, you know what to do (ahem, check out the Eventful Story overview, Listening Guide, and Interactive Score). If the piece isn’t in MITA, you can still prepare profitably by immersing yourself in the cultural movements on which your piece draws. The more you learn about music, the more you become part of its living community. It’s not about impressing people by dropping in the right term during a lull in the conversation. It’s about being able to communicate your passion to others, and to hear theirs in return. It’s about confronting the relationships between music and power, about debating whether Wagner’s anti-Semitism stains his music, or arguing whether the hip-hop of resistance has become overly commodified. Music matters because it cannot help but reflect where a culture is or predict where it’s going. Embrace the Spirit of Music! It's sometimes hard to explain to others why we need music, which on the surface seems to serve little concrete purpose. Yet for millennia humans have acknowledged its central importance to creating community and cultural identity, its unique ability to both console and to challenge. Music continues to elicit a wider range of responses and engagement than any other form of human expression. Within that framework MITA strives to constantly expand your field of vision. Choosing between a MITA Subscription free trial and the free MITA Sampler? Our comparison page can help.